Cedar Keys National Wildlife Refuge is composed of 13 islands along the coast of the Gulf of Mexico near the town of Cedar Key - Florida's oldest port. The refuge was established in 1929 to protect native and migratory birds at a time when their plumage was highly valued for ladies hats. Tens of thousands of egrets, pelicans, herons, cormorants and roseate spoonbills nest in the Cedar Keys. The only way to access Cedar Keys National Wildlife Refuge is by boat. Our map navigation link will take you to the closest public boat/kayak launch, which is in the town of Cedar Key. Rental boats and kayaks are available in town, along with a number of hotels, restaurants and other activities. The town of Cedar Key is a spectacular destination in its own right, and well worth visiting. Probably the most visited island in the Cedar Keys NWR is Atsena Otie - a native Muscogean phrase meaning "cedar island". There you will find beaches to walk, a boardwalk across the marsh, an information kiosk, observation deck and restrooms. In the 1800's, when this area was first settled by people other than native Americans, Atsena Otie Key was home to the village of Cedar Key - as evidenced by preserved ruins and a historic cemetery that can still be visited at that location. 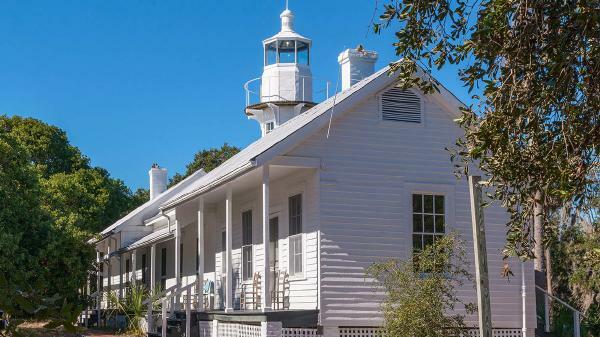 Another popular island in Cedar Keys NWR is Seahorse Key, home to the historic Cedar Key Light Station, constructed in 1850. The lighthouse is owned by the U.S. Fish and Wildlife Service, and is maintained by the University of Florida, which uses it as the headquarters for its Seahorse Key Marine Laboratory. Public access to the lighthouse is only available during open houses and special events. The rest of Seahorse key is open to the public except between March 1st and June 30th, when the island is closed to protect nesting bords.